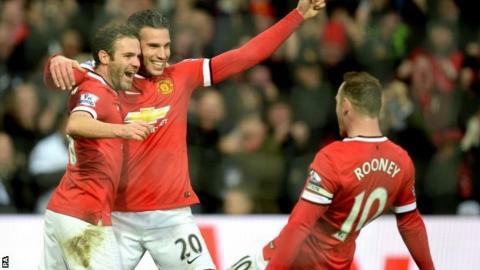 Manchester United can win the Premier League this season, says former player and assistant coach Phil Neville. United lie third in the table, eight points adrift of leaders Chelsea, after claiming a sixth successive win with Sunday's 3-0 victory over Liverpool. Asked on BBC Radio 5 live if Louis Van Gaal's side could win the league this season, Neville, 37, insisted: "Yes, they can. "At the moment, they've got the momentum and you just never know." Neville, who won six Premier League titles as a player at Old Trafford, was part of the coaching team under David Moyes last season. Moyes was eventually sacked as United finished seventh, but Neville said the club can bounce back quickly. He pointed to the "spirit" he witnessed from the United squad after last Monday's 2-1 win at Southampton, when players and officials went to celebrate with supporters who had travelled to St Mary's. "Van Gaal went down there, Ryan Giggs went down there, the goalkeeping coach went down there," said Neville. "All of a sudden, you've got that spirit... that indomitable spirit." United will attempt to close the gap on Chelsea and second-placed Manchester City when they take on Aston Villa, Newcastle, Tottenham and Stoke over the Christmas and New Year period. Neville said the United players will believe they can win all these games and added that he felt the club are benefitting from not playing in European competition, just as Liverpool did last season. Liverpool came close to ending their long wait for a Premier League title, only to slip up and finish second to Manchester City. "There are similarities between the United this year and Liverpool last year, where Liverpool had no Champions League football," said Neville. "They've got no midweek games in Europe and, if teams slip up, you just never know." Captain Wayne Rooney has drawn comparisons with United's last title-winning campaign in 2012-13. In Sir Alex Ferguson's final season in charge, United won the title by 11 points despite rarely playing their best football. "We weren't great in a lot of those games, but we got the results," said Rooney. "Sometimes you have to do that. "We have to believe we can win the title. If we can win our games and the others have one bad result there is nothing there."